Please note that this documentation is still under construction. There are a lot of missing pieces. Client-side Java development took a major step forward with the introduction of Oracle’s JavaFX library. JavaFX is a modern, rich client technology stack that enables Java developers to quickly and easily create desktop clients with functionality and richness that rival, and even surpass, that of native clients and web applications. GroovyFX is a library that makes working with JavaFX much simpler and more natural. GroovyFX is focused on exploiting the power of the Groovy language to make JavaFX development easier and more concise than what is possible in Java. GroovyFX also leverages Groovy’s powerful DSL features and AST transformations to eliminate boilerplate, making GroovyFX code easier to write and, just as importantly, easier to read. All of these are made easy to use through the power of the language and the extensive use of Domain Specific Languages (DSLs). This documentation will take you from getting started with GroovyFX all the way to building full applications with the power of JavaFX and Groovy. The GroovyFX team is made up of the following core committers. We would also like to thank and recognize the following people who have contributed pull requests to GroovyFX. GroovyFX version 8.0.0 includes support for Groovy 2.4, Java 8, and JavaFX 8 only. This version does not work with JavaFX 2. It's strongly recommended to use Java8u60 as a minimum. 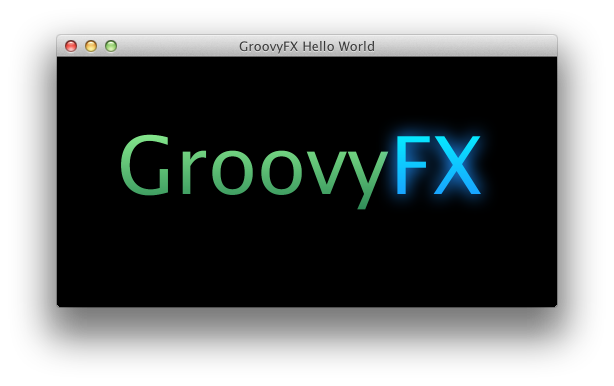 GroovyFX version 0.4 includes support for Groovy 2.3, Java 8, and JavaFX 8. GroovyFX version 0.2 has a number of fixes, new functionality, and other enhancements. This includes some changes that are incompatible with version 0.1. See the Breaking Changes section below for details on these changes. The following changes are not backwards compatible with previous versions. Before installing GroovyFX you will need to install the Java Development Kit (JDK) version 1.6 or above. Download the appropriate JDK for your operating system, run the installer, and then set up an environment variable named JAVA_HOME pointing to the location of this installation. There are several ways in which you can include GroovyFx in your projects. 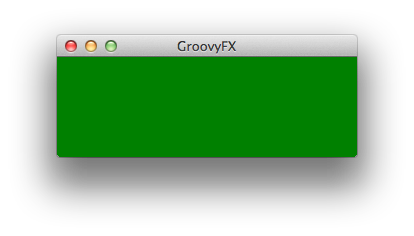 It is also simple to set up your own GroovyFX-based project using Gradle as the build system. This sample build.gradle script will get you started. to set up the rest of your project’s directory structure. You will automatically have a dependency on both Groovy and GroovyFX. JDK8u60 is the minimum version recommended to build a working version of GroovyFX. This will generate a groovyfx.ipr file. From IDEA, select File → Open Project and navigate to the directory containing the groovyfx.ipr file and open it. You should now be able to build the library and run the demos with IDEA. The NetBeans project files are included in the code repository. You may have to set up a Java Platform that includes the JavaFX SDK directory, if one does not already exist. Please see Setting Up NetBeans IDE With JavaFX 2.1 for more information. Once you have created the JavaFX enabled Java platform, then choose the GroovyFX project, right click and pick "Properties". Choose the "Libraries" entry, then choose the JavaFX enabled Java Platform. You should now be able to build the library and run the demos with NetBeans. Also, you may have to fix the location for the groovy-all jar file. Once you have everything set up, try the following Groovy script to test that your setup is functioning as it should. If everything runs correctly you should see the following screen appear. In JavaFX, you display graphics and controls on the screen by constructing a scene graph that consists of various types of nodes - perhaps a circle or a button control. The scene graph is put into a Scene, which defines the area in which your scene graph will be displayed. The Scene can then be shown on a Stage. You can think of a Stage as the application container. If your applicaiton is running on the user’s desktop, the Stage corresponds to a desktop window that typically has a title bar and resizing controls. If your application is embedded into a browser, then the Stage corresponds to the applet’s display area. Except for one other minor detail which we’ll cover in the next section, this is a complete GroovyFX program that, when run, will produce the output below. You can see that we declare a stage with a title attribute of GroovyFX and a show attribute set to true. The title of the stage appears as the text in the application window’s title bar (since this was run as a desktop application). The value of the show attribute controls whether the Stage (the window) will initially be visible. If you leave out the show attribute, its default value will remain false and your applicaiton will be invisible! The scene node is declared as a child of the stage node - that is, it appears within the stage’s curly braces. Those curly braces actually define the stage’s closure, and any node declared within that closure will become a child node. A rectangle declaration appears within the scene’s closure, making the rectangle a child of the scene and the one and only node that makes up the entire scene graph in this application. Those are the only two basic concepts you need to know in order to build rich user interfaces with GroovyFX. You describe the structure of your scene declaratively using closures to indicate the hierarchy of your nodes. You pass attributes to those nodes using Groovy’s key: value syntax (the same syntax used to declare key/value pairs in Maps literals - in fact, under the covers you are really passing a Map as an argument to each node). This sort of syntax is generally usefull for declaring any kind of hierarchical data such as HTML or XML. It is so common that Groovy has built-in support for easily creating classes, called Builders, that allow you to write code using this syntax. Groovy’s MarkupBuilder, for example, allows you to easily create HTML documents using a very similar syntax. It is probably not surprising, then, that the class we have created to allow you to declare JavaFX scene graphs using Groovy’s builder syntax is called SceneGraphBuilder. The nodes in a scene graph are generally referred to as, well… nodes. When you create a Groovy Builder, the elements that you can declare with the builder are also referred to as nodes. In most cases, this won’t cause us any confusion because the JavaFX scene graph nodes all have a corresponding GroovyFX SceneGraphBuilder node, and therefore the term node can be used interchangabely. In those rare cases where we need to make a distinction, we will explicitly refer to builder nodes rather than simply scene graph nodes. Although SceneGraphBuilder provides all of the builder nodes you will use when creating your GroovyFX graphics and UIs, you will rarely use it directly. This is because you will typically begin your applications by calling the static start method of the GroovyFX class as shown here. The GroovyFX.start method takes a closure as its only parameter and, behind the scenes, it initiates JavaFX’s startup sequence. The start method also ensures that the closure you pass will be executed at the appropriate time during the JavaFX startup sequence. Just before your closure is executed, the start method creates a new SceneGraphBuilder object and sets it as the closure’s delegate. This is the reason that you can call SceneGraphBuilder methods like stage, scene, and rectangle within your closure. Those calls will be automatically forwarded on to the closure’s delegate SceneGraphBuilder object when they are not found within the closure’s current scope. Calling the GroovyFX.start method is the missing piece of the puzzle we referred to in the previous section when we first presented this code. The following sections describe some of the generalized behavior supported in the SceneGraphBuilder on all nodes and attributes defined in the User Guide. The following table contains a list of all the GroovyFX node names and their corresponding JavaFX class names. All color and paint attributes may be set with one of the JavaFX Paint or Color objects (javafx.scene.paint.LinearGradient, javafx.scene.paint.RadialGradient and javafx.scene.paint.Color). In addition, colors may be set using the pseudo color variables, such as red, green, blue, etc. Colors may also be defined as a web string such as "#333", "cyan", etc. Colors may also be defined using the JavaFX CSS styles for colors, linear, and radial gradients. (see JavaFX CSS Reference Guide) Also see SceneGraphBuilder - paint for more details. The javafx.geometry.Insets class may be instantiated by using the javafx class, or by using a Groovy number list. If a number list is used, it may contain, one, two, or four numbers. If one number is presented then all sides of the Insets will be set to that value. If two numbers are presented then the first number will be used to set the top and bottom side of the Inset, and the second number will be used to set the left and right side of the Inset. If four numbers are present in the list, the numbers will be assigned to the the top, right, bottom and left in order. An empty list or the String "empty" (or "EMPTY") will map to the Insets.EMPTY object. The Geometry objects in the javafx.geometry package, Point2D, Point3D, Dimension2D, Rectangle2D, and BoundingBox, may be set using numbered lists. For the 2D classes, 2 numbers must be provided, and for the 3D classes, 3 numbers must be provided. BoundingBox may be either 2D, requiring 4 values, or 3D, requiring 6 values. A Rectangle2D may also take and empty list or the "EMPTY" string as shown in the previous section on Insets. All Java Enumerations may be set using their string equivalents. For example, if an attribute field is of type javafx.geometry.Pos, then the value may be set with one of the string values, "center", "bottom_left", etc. There are some special cases where Object instances are used rather than enumerations. For example the javafx.scene.Cursor class contains numerous singleton instances for the various cursors that may be set on the scene. Also, there are special pseudo variables for the Orientation enumeration, horizontal and vertical. scene(cursor: "OPEN_HAND")     // javafx.scene.Cursor static member. ToggleGroups are identified with an unique string across the SceneGraphBuilder context. To tie a toggle type button to a specific ToggleGroup, use the special attribute toggleGroup on the Toggle type button. Buttons with the same ToggleGroup names will be assigned the same ToggleGroup instance. GroovyFX provides an action abstraction inspired by javax.swing.Action. All Action properties are fully observable. All buttons and menuItems support Actions but only if their respective factories are used. In other words, if you manually create an instance of such controls then you must also bind Action properties manually. The following table describes the properties used by JavaFX components that support Actions.